The isle of Lewis in the outer Hebrides is said to be the last place in Britain where the fourth commandment - Remember the Sabbath day, to keep it holy - is still strictly observed. But how has modern life changed attitudes to the Lord's Day on this island of 20,000 people? They used to talk of the Scottish Sabbath, then it was the Highland Sabbath and now it is just the Lewis Sabbath, as the number of places keeping Sunday free for God has dwindled. The Reverend Alasdair Smith, who is now in his 80s, and his wife Chrissie remember the days when people would be "horrified" by someone riding a bicycle on the Sabbath - even if they were cycling to church. Chrissie says: "I went to Sunday school and enjoyed it because you could walk to the school with your friends and if it was a nice day you ambled back. Because that was the only time you got to go for a walk - to church or Sunday school - not for pleasure. "But Sunday was special," she adds. "I used to think wasn't God wonderful to have given us the Sabbath. "I can sit without feeling guilty that I'm not washing or ironing or cleaning." Alasdair Smith says it is a far more liberal society now. His wife says: "There was far more of the hellfire and brimstone preaching when we were young." 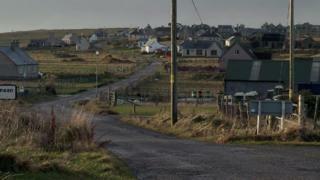 Documentary filmmaker David Cairns travelled to Lewis to find out if the traditional Sabbath still exists there. He remembers the quiet of a Sunday in the West Highlands in the 70s and 80s, where he spent part of his childhood. "We weren't church-goers but my mother always insisted we kept quiet on the Sabbath," he says. "She wouldn't let my dad work in the garden and she would ask me to play behind the house so I couldn't be seen by our neighbours. "As a child I resented that, because it made me feel guilty and furtive. I felt I was being watched and disapproved of - and that didn't seem fair. "But now, as an adult, I suspect the neighbours wouldn't really have minded much if they had seen me - and I understand my mother was showing respect." "What's more, as a city-dweller, I hate that Sunday is beginning to feel as busy as any other day of the week. A day of rest every week is a good thing for everybody. "I'd be really happy not to be able to go shopping on a Sunday - it would force me to spend the day on other things, more important things. "But, on the other hand, I wouldn't want to not be able to get to hospital because there was no public transport." He adds: "The irony is that when I decided to make a film about the Sabbath, I was committing myself to working every Sunday for several weeks. "I also had to ask people who keep the Sabbath to let me film them on that day - meaning I would be working, breaking the commandment. Some agreed to it - but others did not. "Ultimately, it isn't just the quiet Sunday I miss: it's a whole culture - people who had lived in just the same spot for generations, faith, a strong sense of community and identity. I wanted to see if these things still exist in Lewis - the Sabbath is only part of it." One of the people interviewed for the film, the Reverend Angus Smith, protested against the first Sunday ferry to Skye in 1965 and again when Lewis eventually got its first Sabbath sailing in 2009. He says: "Things have changed. We have so many incomers on the island that the whole balance has changed." Amanda Darling could be said to be an incomer, even though she arrived in Lewis to marry an islander. Mandy loves traditional music and even speaks Gaelic but she is not keen on the strict Sabbath observance. She says: "When it is howling with wind and rain and dark it would be quite nice to go to the swimming pool or the sauna. "I would quite like to go to the sauna on a Sunday afternoon. Go to church in the morning if you want to." For Mark and Rae MacDonald, observance of the Sabbath was one of the reasons why they moved back to Lewis from Edinburgh. Rae says: "God wants us to have a break from our work outside the home and inside the home. "We eat light meals so there is not too much kitchen work. "It gives us time to spend with our children and focus on their souls as well as our own." Her husband Mark says: "This community has always welcomed people who come here because they like it. "But people who are Lewis born and bred question the moral integrity of moving to a place and not liking the way it is and trying to change it." Two people who moved to the island and grew to love it are Jutta and Rille Grix-Feldt, who run the Juri Startent gallery in Uig. Rille says he was a city boy from Berlin when he first came to the islands and he did not like it. But 20 years later he loves the lifestyle and the community, even if his observance of the Sabbath is borne out of respect for his neighbours rather than Christian devotion. Jutta says: "We keep the ground rules, for example, 'don't put washing out on a Sunday' and the gallery is closed. "We don't have a barbeque in front of the house and drink wine," she says. "But I wouldn't let myself be told not to have fun on a Sunday going swimming." Her idea of a fun Sunday swim is a dip in the ocean. But Jutta says she likes Sundays on Lewis because the Sabbath gives the "freedom" to read, relax and think. She says: "Even if there are only some people who are still believing in the Sabbath I respect them. "I accept it because on the other hand there is such a culture of communal support that I think you don't find very often." But it is not just "incomers" who are glad to see that Lewis has changed. The island now has Sunday flights, restaurants, pubs and one shop. Uisdean Macleod says: "There is something about coming from an island that gives you quite a sense of belonging to a place. "I want to live here but I want to have the same opportunities that are available everywhere else, especially for the kids." The BBC Scotland programme Last Sunday will be broadcast on BBC Two Scotland at 19:30 on Friday 24 October.